Holiday season is here, and more than any other time of the year, people like to deck out the inside of their homes with signs that it’s cold outside…but chestnuts are roasting on an open fire. 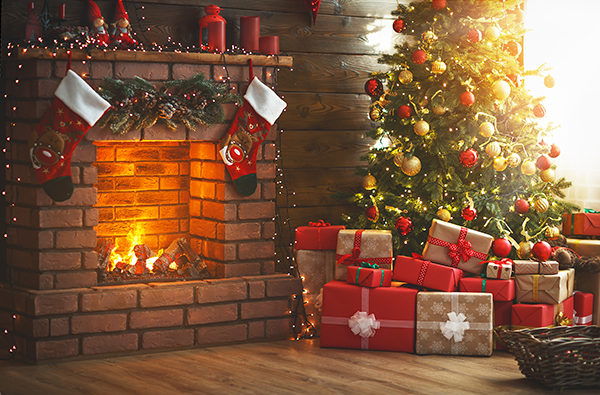 Deck the halls with these great Christmas fireplace ideas for making your mantle into a Christmas masterpiece. 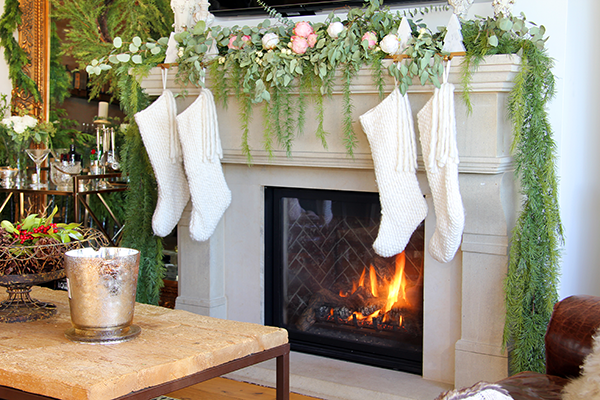 Can’t go wrong with one of these Christmas Fireplace Ideas! It’s traditional, and much loved all around the world. The wreath actually comes from ancient times—it was used by the Romans as a symbol of victory—but since then was appropriated by the church as a symbol for the advent (counting down to Christmas) and a suggestion of the timelessness of eternity. Granted, these days, we probably don’t contemplate the spiritual symbolism behind wreaths. We just think they look cool. And they definitely say “Christmas is coming.” The “traditional” looking wreath is made from evergreens, interspersed with red berries, red ribbons, and possible some symbols of the season, like ornaments, bells, and maybe candles. But over the years, wreaths have gotten a little more creative. With the advent (pun intended) of fake greenery, you can have whatever color you want: red, blue, silver, and others. You can even personalize your wreath for your family, putting in family pictures or symbols that relate to your clan (like sporting items, musical instruments, or keepsakes from vacations…whatever might apply to your family). Have fun with it, if you do decide to veer from the traditional scheme of red and green. However, just remember to play it safe. Make sure your wreath is firmly affixed to the wall, and that preferably the greenery (or “greenery”) is sprayed with some sort of fire-retardant material… otherwise, you might be celebrating a Johnny Cash Christmas (and it burns, burns, burns…the ring of fire). Christmas Fireplace Ideas are essential. Advent calendars are obviously rooted in a religious tradition of counting down towards the 25th of December, but over the years they’ve taken on some more simultaneously secular and celebratory notes. You can get themed advent calendars for just about every area of interest, from healthy eating to Legos. Why not make the space above your fireplace one big advent calendar? If you’re crafty, you can turn a shelf-organizer unit into space for 25 little trinkets. You can put all the items into the calendar-display and show them off for all 25 days, or perhaps put a new one in each day, until all 25 days are marked. 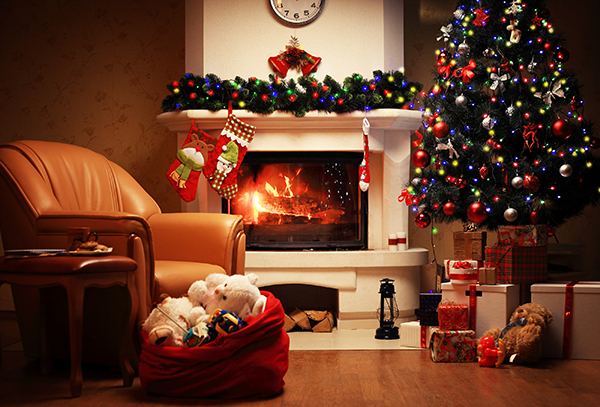 You could use anything from ornaments to candles to items that carry a personal significance to your family. Get creative! Another idea might be just to use a paper advent calendar with pages that countdown to Christmas, and frame it inside of a wreath. In that way, you can combine the wreath and advent calendar ideas into something that transforms your fireplace into the spaceport for Santa’s landing. One of many Christmas fireplace ideas and a traditional one. No one is really sure where the idea came from, but legend has it that the original Santa Claus (St. Nicholas) once tossed a stocking full of coins into the home of a poor man who needed to marry off three daughters. Ever since then, children eagerly hang up stockings, hoping that the jolly man invented by Coca-Cola will drop something nice into their over-sized cloth boot…and hopefully not a lump of coal. You can buy stockings anywhere, and just like wreaths, there are some traditional ways to go in terms of material and design. On the other hand, you can buy a craft kit and make your own. If you’re super handy, you can even knit some. If you’re not, maybe grandma will oblige and pick up the darning needles. As you draw closer to the big day, you can drop some tantalizing gifts into the stockings, to be little appetizers to the bigger parcels under the tree. Just remember to play it safe, and make sure your stockings are firmly nailed to the mantle. Avoid putting food items (like chocolate) into the stockings if it could melt unless you want whoever’s opening it to be greeted by a sweet-tasting surprise that looks like reindeer droppings. If you’re like most people in the land of red, white, and true, you have a favorite sports team, and that team has its own colors. Now, if you’re a football fan or an avid follower of the NBA or Canadian (I’m referring to hockey with this last one, folks), your team is actually in season right now. In fact, they may even be playing on one of the big holidays, like Thanksgiving, Christmas, or New Year’s Day. Of course, if you’re more into baseball, your team might be hibernating in a tropical or desert location, but you can still go along with this idea. Take your team’s colors and turn your fireplace into a seasonal ensemble with those colors. You can buy strands of plastic greenery with that color, nutcrackers with that color, and ornaments with that color, or perhaps some ornaments that relate to the team or the sport directly (many teams will be selling these). Your fireplace will look like an awesome way to rep your local heroes, while also providing a seasonal ambiance to your home. Again, make sure all the items are securely placed on the mantle, either by nailing them down or applying some adhesive you can later remove…you don’t want to risk having your Boston Red Sox Nutcracker fall into the burning inferno below…although if you happen to be a Yankees fan and someone else put that nutcracker there, you probably won’t mind if that happens. This last one may be a little pricier of the Christmas fireplace ideas unless you choose to go the homemade route, which you can do with cardboard or gingerbread. Many craft stores have a whole section (that you’ve probably seen and admired) of miniature homes and people, like a scene out of Victorian England. Miniatures are especially popular in the winter season, especially trains. In fact, you might even have a train running around your tree already! The custom originated with Protestant communities in the United States who would build Nativity scenes during Christmas season, and other scenes from the Bible as well. Over time, these little miniature worlds picked up some secular overtones and themes. If your mantelpiece is big enough, try turning it into a little Christmas Village. If it’s not, and you’re handy, you could possibly nail a shelf onto the mantel, and take it down after New Years. Either way, if you have a secure space above the fireplace, you can deck it out with little homes, people, and trees to make a Christmas Village. Trust us when we say that your home will be the coolest one in the neighborhood if you can pull this one off, but make sure you can do it safely, especially if you have kids or pets. If the mantle is not deep enough, you could find even smaller models, or just make some shallow half-sized homes of your own with cardboard, which gives you and your kids a nice opportunity to do a fun seasonal craft together.